According to his supporters, Colin Kaepernick is being blackballed not just because of his taking of a knee during the national anthem, but because he was doing to protest racial inequality. They believe the reason he hasn’t been signed by an NFL team as of yet is that the league is racist. 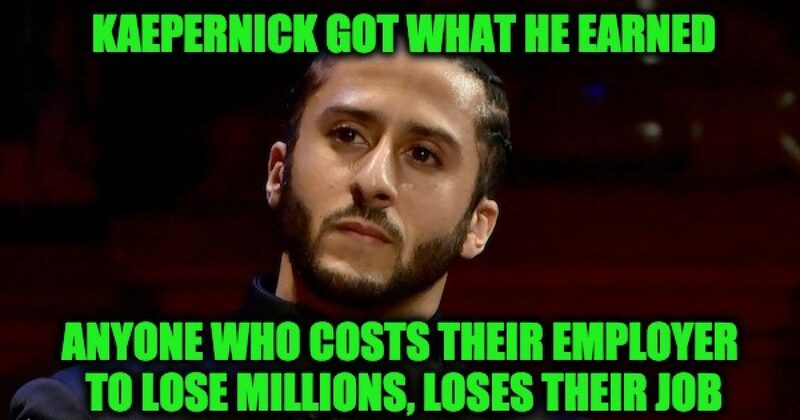 In truth, Colin Kaepernick’s difficulty in finding a new job stems from the fact that he’s a mediocre quarterback who demonstrated disrespect for America, the league, Fans, and the TV networks which basically pay his salary. In other words, he got what he deserved. Keep in mind that he wasn’t fired from the 49ers, Kaepernick opted out of his 49ers contract because they wanted him to be the backup quarterback, and he became a free agent. I would gander that it is true that Kaepernick is unemployed because of his protest, taking a knee during the national anthem. More than one study concluded that his protest caused fewer people to watch NFL last season and the season before. Like every other American, Kaepernick has the right to peaceful protest. 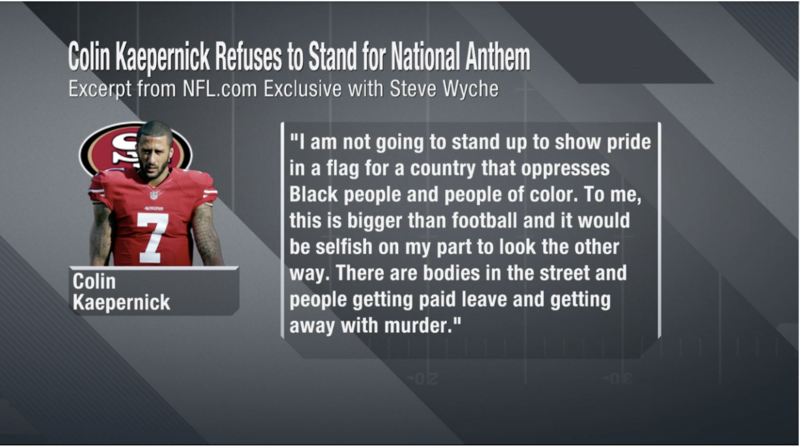 However, like every other American, Kaepernick must deal with the consequences. For the two seasons before this one, the Kaepernick protest caused a rating drop. That rating drop led to a significant decrease in advertising revenue for the NFL’s TV partners–those partners are the reason the NFL is as successful as it is, giving the teams the ability to pay large salaries to the players. In other words along with showing disrespect to this great country that gave him so much Kaepernick crapped all over the league’s partners. Anyone, in any other industry who causes a significant revenue loss to his employer’s partners, would find it difficult to maintain employment. Also by aligning himself with the radical anti-cop, anti-Semitic Black Lives Matter movement, Kaepernick has become an icon of the BLM movement’s bullying during a time in which the NFL had enough irresponsible man-children. Coaches and general managers were not thrilled with the prospect of bringing his style of childish anger to their organizations, let alone have NFL commentators focused on the trendy pre-game ritual of a bratty backup rather than the actual game. The Daily Caller published additional information regarding Kaepernick’s true intentions in the league, the unemployed quarterback had turned down job offers from NFL teams to maintain his narcissistic position on top of the victims of racism list. “Despite the ongoing narrative that Kaepernick’s very public political views are preventing any NFL teams from offering him a roster spot, The DC’s source claims Kaep himself has turned down at least one contract in the hopes of stirring up a media frenzy that eventually leads to a more lucrative deal for the 27-year-old vet. “Kaepernick allegedly doesn’t want to make ‘backup money’ and specifically instructed his representative team not to sign one contract offered at the league’s minimum rate of $900,000 per year for a seventh-year player. “Shortly after the 2017 offseason began, Kaepernick parted ways with XAM Sports — the agency which had represented him since he entered the league in 2011 — and TheDC’s source added that Kaepernick’s girlfriend, outspoken radio host Nessa Diab, appears to be a driving force behind his negotiating tactics. He adds he “absolutely 100 percent” took a hard look inside of himself. Why should Maroon 5, or anyone else turn down an incredible opportunity because of a self-absorbed mediocre quarterback who hurt the business who paid his salary?